After encountering the frenzy and blazing debates on the repercussions of 2012 and 2014 NTI reports, the year is again open to the same heated arguments once again. Being a national of the South Asian country where the matter of nuclear security always remained an important issue, this article is an attempt to analyse the 2016 NTI Nuclear Security Index. Nuclear Threat Initiative (NTI) founded by US Senator Sam Nunn and CNN Founder, Ted Turner, works to strengthen global security by reducing the unauthorized and accidental use of nuclear weapons, preventing the spread of biological, chemical, radiological, and nuclear weapons. In addition, the NTI also assesses and evaluates the safety at nuclear facilities worldwide. The NTI 2016 Nuclear Security Index ranks 25 countries that possess “one kilogram or more of weapons-usable nuclear materials.” Both India and Pakistan fall into this category. In Asia, while China is ranked 20th, India and Pakistan are placed 23rd and 22nd in the index out of the 24 states with weapons-usable nuclear materials. 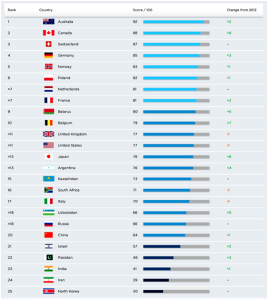 Japan occupies the 13th position but has moved up 6 places from 2012 NTI ranking. The top position has been retained by Australia. Among the nuclear weapons states, France is placed at the 7th position, United Kingdom and United States occupy the 11th position. The third edition of the NTI Report released in January 2016 is prepared in collaboration with the Economist Intelligence Unit (EIU). This year’s report has a new addition to the index that is the sabotage ranking, which reviews the nuclear security environment in 45 countries based on potential sabotage risks. The theft ranking and sabotage ranking scores assesses the contribution of 24 states across five broad categories (1) Quantities and Sites, (2) Security and Control Measures, (3) Global Norms, (4) Domestic Commitments and Capacity, and (5) Risk Environment. The table below depicts the country-wise ranking in the 2016 NTI reports and the change from the 2012 NTI Report. 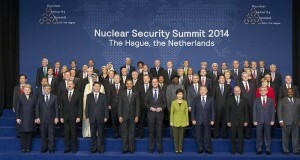 The fourth and final gathering of the world leaders for Nuclear Security Summit (NSS) is planned for March 31 – April 1, 2016 in Washington D.C. The 2016 Washington NSS will culminate the series of three summits held in Washington, DC (2010), Seoul (2012), and at The Hague (2014). All the three summits tried to draw attention to the threat of nuclear sabotage, security of facilities and sites, safety of fissile materials including while in transportation and nuclear terrorism and establish a mechanism to enforce the countries to take stronger measures to prevent nuclear terrorism. Speaking about the NSS process, NTI Co-Chairman and Chief Executive Officer Sam Nunn stated, “President Obama launched the summit process and he and his team as well as a host of committed world leaders, deserve credit for their achievements so far … and the work is not complete, however, and a plan to sustain high-level political attention on nuclear security must be a top priority at the Summit in Washington DC.” This statement creates an impression that the process of NSS has to go beyond the Obama Administration. However, there is no authentic information in the public domain as of yet whether the NSS process is likely to continue. Likewise the NTI President Joan Rohlfing said “The current global nuclear security system has dangerous gaps that prevent it from being truly comprehensive and effective … Until those gaps are closed, terrorists will seek to exploit them. Leaders must commit to a path forward when they meet this spring. The consequences of inaction in the face of new and evolving threats are simply too great.” Rohlfing’s statement too reflects the desire to continue the NSS process beyond the 2016 NSS Summit. It is pertinent to mention here that even though nuclear security is solely the sovereign right of a state, many countries should take the collective and mutually agreed steps to guarantee safety and security against the existing global threats. By and large, the NSS outcomes cannot be expected as a binding legal instrument and its operating mechanism are political in nature unless the states have signed the conventions. This situation creates an imperative to continue the NSS process beyond 2016 Washington DC summit . Although Pakistan is one rank ahead of India in the NTI 2016 rankings, it still falls in the bottom of ranking for theft of nuclear weapon use-able material. The current NTI Index admits that Pakistan passed new cyber security regulations but it argues that the process of progress was too diminutive to upgrade its score. This is of course a subjective assessment that ignores their own statistics as given in the table. Pakistan is taking steps to update its nuclear security regulations and to implement nuclear security best practices. The NTI Report mentions that Pakistan’s improvement is primarily due to an “increased score for on-site physical protection resulting from new laws and regulations requiring licensees to provide physical protection to nuclear sites and on-site reviews of security.” Regarding the on-site physical protection the report mentions that “Pakistan, improved its score by three points compared with 2012, and demonstrated the largest improvement by any nuclear-armed state.” It is also pertinent to mention here that Pakistan has well-designed, skilled and committed nuclear security force approx 30,000 in number, which is geared to provide security, control and physical protection of its nuclear facilities and materials during transportation. Despite deteriorating law and order situation in Pakistan not a single event of nuclear facility or radiological material’s theft has been reported so far which is commendable indeed. However, there is always a room for improvement and Pakistan needs to be vigilant to take measures to further improve the safety and security of its sensitive facilities to further improve its ranking in future.